As soon as you enter the grounds, this beautiful villa feels spacious, calm and filled with light. The gardens and pool terraces are exceptionally well maintained and very private. The pool measures 12 x 5m and can be entered from the terrace by Roman steps. There is plenty of space outside to enjoy the sun, read and relax. There is also a spacious furnished outside naya, which is perfect for al fresco dining, barbecuing or watching the sun set on the warm evenings. Inside the villa, the high quality furnishings and fittings are sure to enhance the enjoyment and relaxation of your holiday and will make you really feel at home. The beautiful main bedroom is situated upstairs, which has its own dressing area and impressive en suite bathroom with walk in Roman shower and bath. It’s French doors open out onto another huge private sun terrace with breathtaking views. The first floor has a lovely double bedroom with large en suite bathroom. Patio doors open out from here onto the pool terrace/garden. This level also has a twin bedroom and another large double bedroom with an attractive bathroom and walk in shower. Both of these open out via their own French doors onto the terrace leading to the pool. All the bedrooms are equipped with AC & elegant ceiling fans. The luxurious lounge is equipped with SKY TV/DVD/WIFI and this leads through to the stylish dining room, The kitchen is modern, spacious and finished to a very high standard. It is furnished with all modern appliances, such as hob, dishwasher and microwave. Adjacent to the kitchen is a convenient utility room containing a washing machine. In the winter, the villa has under floor heating and a modern, Italian designed, pellet fire. This is an incredibly efficient and cosy way to warm up the villa in the cooler, winter evenings. This is an incredibly well designed, comfortable and elegant villa. It is a perfect setting for both families with children or those wanting a quiet holiday with the luxury of home. Robyn and I built this property because we fell in love with Javea and the breathtaking views. Lilavadee is named after a beautiful Thai flower. We choose this name because of the impact Asia has had on our lives after living and working in Hong Kong. You would be hard pushed to find a more beautiful view in this part of Spain. The master bedroom upstairs has a spacious en suite bathroom with walk in Roman shower and bath. Downstairs there is another beautifully finished en suite bathroom and a family bathroom with a walk in shower. All bedrooms have air con. Also the bedrooms have ceiling fans if guests prefer. Underfloor heating. We also have a new stylish Italian designed pellet burner in the living room. This is very easy to use, and incredidly efficient in terms in terms of heating costs in winter. Economic and efficient pellet burning fireplace inserted into the fireplace. Top of the range, designed and imported from Italy. Suitable for winter lets at Xmas, Jan, Feb and early March. Bath towels provided, but guests will need to bring beach towels. Plenty of seating and a lovely pellet burner for the cooler winter evenings. A 4 ring ceramic hob. Both an espresso machine and a filter coffee machine. Loads of stylish plates, glasses etc for your every need. Lovely modern kitchen. Oven, electric hob, microwave, coffee machine, toaster. Lots of books to borrow. 2 great courses one within 5 mins and the other 20 minutes drive. The elegant lounge with feature fireplace is a perfect central area in the villa to unwind and relax and is also equipped with SKY TV/DVD player and WIFI. The lounge has amazing arch windows and patio doors leading out onto the terrace overlooking the pool, with superb sea views in one direction and mountain views in the other. To the left of the lounge, this area steps up into a dining area with a large dining room table for inside dining with patio doors leading out onto onto the naya. In the winter, the villa is equipped with efficient under floor heating in all rooms for those cooler evenings. The outside naya is perfect for sitting in the shade, enjoying an aperitif or for al fresco dining. There is also a gas BBQ situated here for those warm, relaxing evenings when it seems easier to stay in. To the left of the hallway is the kitchen, equipped with oven and hob, microwave, dishwasher and fridge freezer. Beside this is a separate utility room with washing machine and storage area. The villa is stunning. Beautifully decorated with everything you could need. Thank you so much for your positive feedback. We re so pleased you enjoyed staying in our villa and had a wonderful holiday. We hope you will return again in the future. Wonderful villa. We had a great 9 week stay here. Love the new pictures. We've already booked for 2018. Wonderful villa. Loved the new pictures. Already booked again for 2018. We have stayed in Villa Lilavadee last year so knew what to expect. It is beautiful and has everything you need for a relaxing holiday. We booked 2 weeks this year, end of August. The weather was gorgeous, even the forest fires couldn't spoil it for us though we're quite scary at times. We have booked again for next year although could only get a week as the word is getting around how nice the villa is and it's getting booked up very quickly. The view is to die for and we sat on the terrace every morning watching the sun come up and then again every evening watching the sunset. The trip to the beach is roughly 12 euros. The taxi company speak English so didn't have a problem. We walked a couple of nights to the local Elefante restaurant, the food is good but the service slow but not a problem for us. The bars on the beach to the left of the Parador hotel offer a good beach bar crawl into the old town. Stayed in villa for first two weeks in October and can honestly say that the villa has the WOW factor . It is beautiful , loads of space and most importantly it has little areas to retreat to if you go on holidays with family!! . Villa Lilavadee is such a high standard and a fantastic villa. Thank you that is really positive feedback. We hope you will consider staying with us again in the near future. We really had an excellent time in this lovely villa. It is extremely well furnished, homely and we definitely hope to return in the future. Thanks to the weather and the heat, we sat out in the sun everyday and the pool was fantastic. This stunning villa, located on a secluded hillside, offers spectacular views of Javea, the Montgo and the sea. Due to its panoramic position, the garden and pool receive sun all day long. The location is private, secure and peaceful, surrounded by orange and olive groves. The villa is conveniently situated just five minutes drive from the sandy 'Arenal' beach area in Javea, with restaurants, bars, shops, boutiques and a wonderful boulevard to stroll down alongside the beach on the warm evenings. A couple of minutes’ drive further along the coast road and you are in the picturesque Port and Marina containing some fabulous seafood restaurants and ‘tapas’ bars.The nearest supermarket and shops are just a few minutes’ drive from the villa if you prefer to eat in or use the BBQ. The Elefante Restaurant is within walking distance of the property and there are several other beautiful villages and places to see and eat within close proximity. Golf: The golf courses of the Costa Blanca enjoy less than five days of rain from November to March, so provide the perfect escape for golfers looking for a winter golfing getaway. There are 3 courses within easy reach of the villa. The nearest course is Club De Golf de Javea in the direction towards Benitachell (Benitatxell) (Ctra. Benitachell 4 ) which is less than 3 km away and only a few minutes’ drive. It is a beautifully maintained 9 hole parkland golf course with a 20 bay driving range. Denia Golf course is 8km away and about a 15 minute drive. This is a more demanding 18 hole course designed by Jose Maria Olazabel and is next to the Marriott Hotel complex (03749 Jesús Pobre-Dénia). One of the best courses on the Costa Blanca is the Olivia Nova Golf Club (Urbanization Oliva Nova Golf, 46780 Oliva) which is about 30 minutes’ drive from the villa. This course is designed by Severiano Ballesteros and is a stunning and highly recommended course for more experienced players. 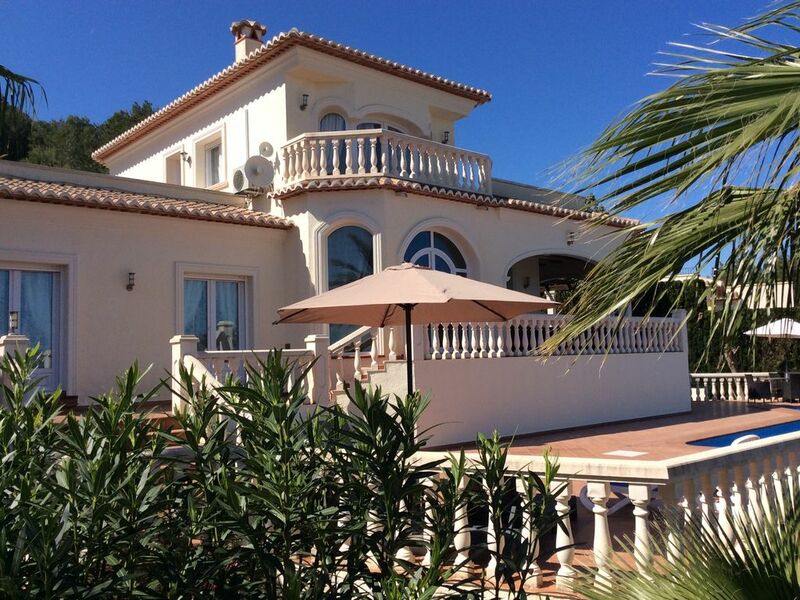 Please contact us if you wish to rent the villa for a long term let. We can arrange a very competitive price.During the winter months (from November to March) additional fuel surcharges will be added to the cost of the weekly rental for the under floor heating and extra use of electricity. This will vary in price according to the amount used.